North Grand Cinema gift cards, either "virtual" ones that you print yourself, or the physical gift cards, work interchangeably at the North Grand Cinema. You can purchase either type here online, or you can purchase the physical cards at the theater. We offer you the ability to purchase a gift card online that you can print yourself! This is great for a last-minute gift. As long as you have a printer, you can purchase and print your own gift cards, without leaving the house (or your PJ's!). Also, you save the postage and handling fee with virtual gift cards. 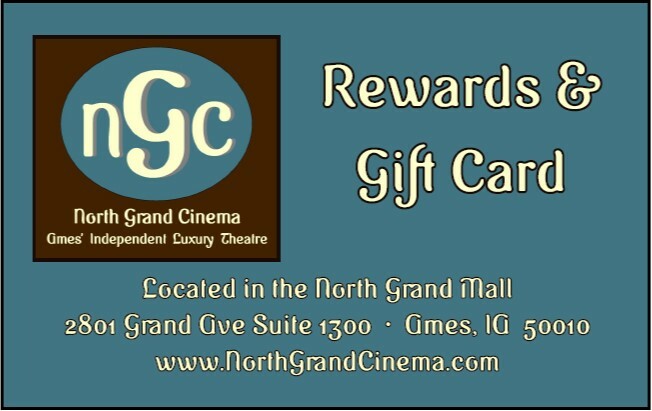 You can purchase North Grand Cinema gift cards in-person at the theaters, or you can order them here. There will be a $2 postage and handling fee per card if ordered online (there is no additional fee if you purchase them in-person). There is a minimum of $10.00 for a physical card. Remember, you can always add money to an existing card. 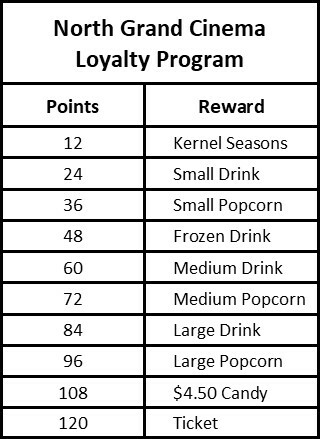 After 120 points, you start over again on rewards.When you earn a reward, you can use it right away, or keep it on your card to use it at a later time.